Imagine standing in front of a building of 23 storeys high. It is not a building, but a tall tower with huge fan blades. The sight is impressive and intimidating. It is the new wind turbine of Hong Kong Electric at Lamma Island. This is Hong Kong's first commercial-scale wind turbine. Construction work is also in progress to turn the site into an education corner for wind power and other forms of renewable energy. The 800-kW wind turbine can generate electricity when wind speeds are in the range of 3 to 25 meters per second. With commissioning scheduled for early 2006, the wind turbine is expected to produce 1GWh of electricity a year. The tower hub is 46m high and the rotor diameter is 50m; so the highest point of the tip of the blade is 71m above ground, slightly higher than a 23-storey building. Wind power is environmental friendly as it does not consume hydrocarbon and does not emit waste. However, it is difficult for wind turbine to ensure a consistent supply as its operation depends on the strength of the wind. For the time being, it remains supplementary to fire power turbines. The new plant will blend in with the local environment with light color scheme, while trees and scrubs will be planted in the site area to minimize landscape and visual impact. However, its size and shape are still great distraction to the natural scenery. I saw wind turbine farms outside Los Angeles and Copenhagen. They are all very ugly and dominate the skyline. Furthermore, there are environmentalists lobbying to stall the operation of wind turbine farms owing to their threat to birds. With a rotation speed of 15-24 rpm and a circumference of 157m, the speed of the tip of the blades is about 188 km/h. It is comparable to hurricane speed and is fatal to birds fly-by. Luckily birds can avoid the moving blades and the mortality rate is low, except when the wind turbine is too low as to affect birds preying near ground level, or when it is on bird migrating route where a large number of birds are travelling through. 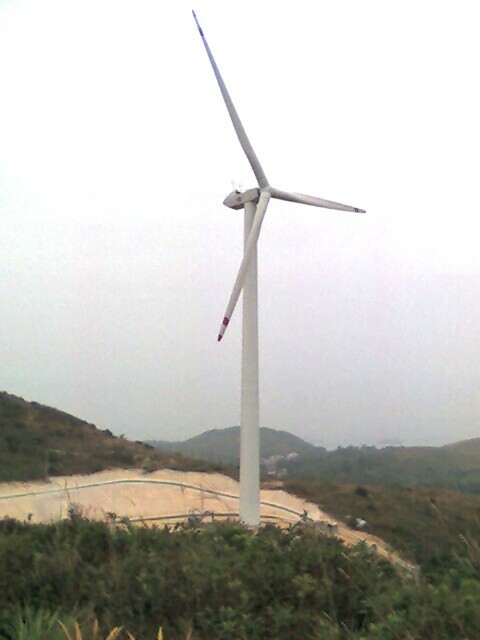 The wind turbine is located on a small hill behind Yung Shue Wan. It will be turned into a tourist spot next year. I therefore suggest those interested to visit it as soon as possible to avoid the crowd. The hiking to the site is not strenuous and is suitable for the elderlies and children. A trip at leisure pace will take about one hour. For those who are more energetic, the trip can be extended to other parts of Lamma Island; for example, take another hour of hiking to Sok Kwu Wan for a seafood meal. Some tips for the photographers, the viewing point is on the east side of the wind turbine, so the sun will be in your eyes in the afternoon. It is better to visit early in the morning.